Click here for a three-page printable version for free distribution to parents. All children act in annoying, obnoxious, or hurtful ways at times, and they don't always cooperate with our requests. Before dealing with inappropriate behavior in children, it is useful to know why they act the way they do. Once we know this, it is easier to be effective problem-solvers. 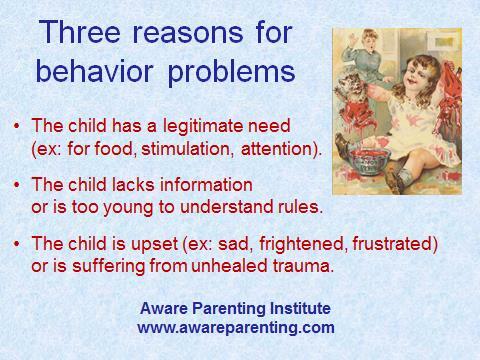 We can explain almost all unacceptable behavior in children by one of the following three factors. 1. The child is attempting to fill a legitimate need. Children have many needs that are not always met, even with the best of parenting. However, each need must be filled if we are to expect "good" behavior. Obvious needs are for food, clothing, shelter, and love. Additional needs are for physical closeness, individual attention, an intellectually stimulating environment, meaningful activities, and respect. When children's needs are not filled, they do whatever will get our attention. A child who is hungry for dinner may slap repeatedly at the newspaper father is reading to get his attention. A child who is feeling bored while waiting in line at the bank or post office may begin to provide more interesting stimulation for himself by running around. It is unrealistic to expect young children to behave well when they are hungry or bored. To prevent problems such as these, we can have healthful snacks on hand, and we can bring along simple toys to keep children occupied if we expect long waiting times. Children need lots of individual attention, but it is hard for them to ask for it in mature ways. Instead, they may refuse to entertain themselves, cling to their parents, or even pick a fight with a sibling. People often say of a misbehaving child, "He's only trying to get attention," implying that he shouldn't be given any because this is not a legitimate need. However, the need for attention is quite legitimate, and children do not ask for more than they need. 2. The child lacks information (or is too young to understand or remember rules). Children are born knowing nothing of our complex world. They must learn that windows are breakable, that people don't like crumbs in their beds, and that busy streets are dangerous. As parents, we must provide them with the information they need to live safely and happily in our society. It is interesting that the word "discipline" comes from a Latin word meaning "to teach." We cannot expect toddlers (under two years of age) to learn to follow household rules, because they are incapable of understanding the concept of a rule. They live very much in present time, and we need to handle each situation patiently as if it were entirely new. It is for this reason that we need to build limits into a toddler's environment as much as possible by baby-proofing our homes. When unacceptable behavior does occur in a child this young, rather than attempt to set rules, the best approach is to determine what the child needs at the moment, and find acceptable ways to meet those needs. For example, if your daughter tears your unread magazines, you can place them out of reach, but give her old ones to tear up. By two years of age, most children begin to understand the concept of rules and are able to remember and follow a limited number. But we should not expect too much of a two- or three-year-old. Gradually, during the early childhood years, children can remember more household rules and are generally willing to follow them, provided their immediate needs are being met. When giving rules, it is always more effective if we explain, in language the child can understand, why certain limits must be set. (ex: "You may play with water in the bathroom but not in the living room, because I don't want the rug to get wet.") Be prepared to give reminders as needed. One effective way to communicate information is to let natural consequences occur, when appropriate. For example, if your son chooses not to clean up his room, he may need to suffer the consequence of not being able to find a favorite toy. He will learn the value of keeping an orderly room much more effectively this way than by parental lecturing or control. Although natural consequences can be helpful, I do not recommend creating artificial or "logical" consequences, because children often experience these as punishment, and they become angry and resentful. Another way to communicate information is to give "I-messages" (for example, "I hate crumbs in my bed!"). This form of communication lets children know how we feel, and it can be much more effective than giving orders ("Go eat somewhere else") or "you-messages" ("You're a slob"). Children continue to need information as they grow older. Even teenagers, sophisticated as they may appear to be, still have much to learn. Whenever unacceptable behavior occurs, it is always a good idea to check into the possibility that your child simply lacks the information that would allow him to make wise choices about how to behave. 3. The child is suffering from stress or unhealed trauma. This is perhaps the most important, but most misunderstood, reason for unacceptable behavior. Children are not very eloquent about expressing their feelings verbally. Instead, they tend to show their feelings through their behavior. When a child is feeling scared, hurt, jealous, frustrated, angry, disappointed, discouraged, confused, or insecure, he will act in ways that give clues to how he is feeling. For example, a little girl who imagines spiders in her room might resist going to bed. A jealous older brother might repeatedly tease his younger sister. A very frustrated or frightened child might start hitting or biting other children. 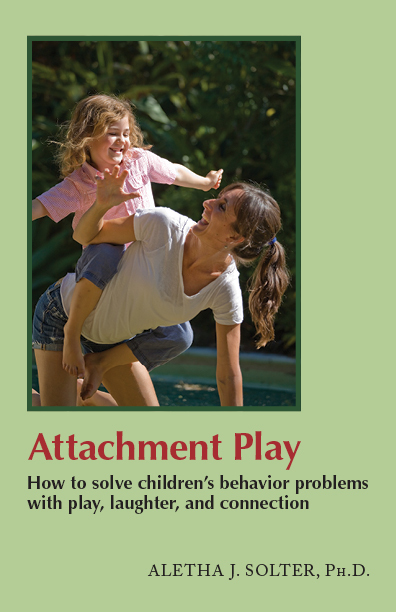 A child who is feeling disconnected and insecure may become whiny and clingy. Once you have ruled out all possible needs and given necessary information, you can consider any misbehavior to be an indication that a child is experiencing strong and painful feelings. Instead of punishing or lecturing, you can try to figure out why the child is feeling hurt, frustrated, or scared. If you can eliminate the cause of stress and provide reassurance, closeness, and love, the child's behavior may improve. Sometimes, however, there is no immediate cause for a child's painful feelings. Instead, the child may be suffering from earlier, unhealed trauma (such as birth trauma, hospitalization during infancy, the mother's postpartum depression, or abuse). Children with early traumas such as these often harbor feelings of intense rage or terror, which can lead to serious behavioral problems. More recent events, such as an argument with a friend, a frightening film, or a disappointment, can also lie at the root of a child's difficult behavior. When children are suffering from the effects of past hurtful events, a stress-free environment with plenty of love will probably not be sufficient to change their behavior. Luckily, children know how to heal from trauma by releasing pent-up emotions through play, laughter, crying, and raging. Our role is to support these natural stress-release mechanisms, which allow healthy outlets for anger, fear, or grief. Children who cry and rage about seemingly insignificant events are usually attempting to heal from earlier trauma or frustrations. If we can be loving listeners and sounding boards, our children will heal from trauma, and much of their obnoxious, uncooperative, and hurtful behavior will simply disappear. It is important to remember that there is always a good reason (either past or present) for children's tears and tantrums. When children are hurtful towards others, we can help by stepping in and lovingly interrupting the behavior (either verbally or with gentle restraint). If a child seems to be having a hard day, hitting or biting other children, you can remove him from the group but stay with him and hold him, saying, "You seem very upset today. Let's be together for a while." This often allows tears to flow, which is the stress-release that is needed. After a good cry in your arms, he will feel much relieved and reconnected with you, and he will probably show no further signs of aggressive behavior. Sometimes, when two children are arguing or fighting, a useful approach is to act as a mediator. You can encourage each child to tell what happened and to express his or her needs and feelings. (This might include some crying.) 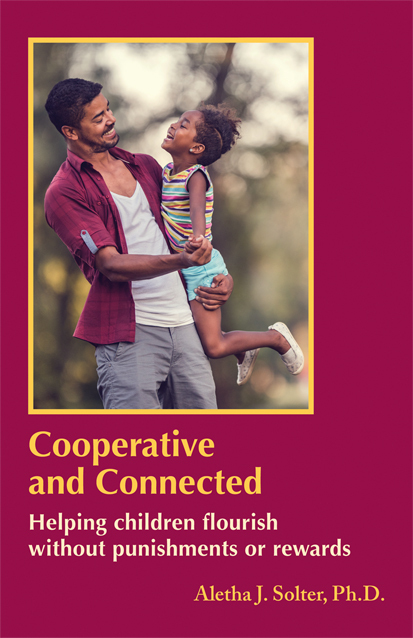 Without judging or taking sides, you can reflect back what each child is feeling and encourage them to find a mutually agreeable solution to their conflict. Most unacceptable behavior can be explained by the fact that the child has a legitimate need, lacks information, or is suffering from stress or unhealed trauma. Because of this, punishment and withdrawal of love are never helpful in the long run. It is paradoxical, yet true: children are the most in need of loving attention when they act the least deserving of it ! If we can remember to look beneath the surface to figure out why children act the way they do, we can give them the kind of attention that is appropriate to each situation. Aware Parenting gives parents tools to raise children without punishments or rewards, to meet children's needs, and to help children heal from stress and trauma.